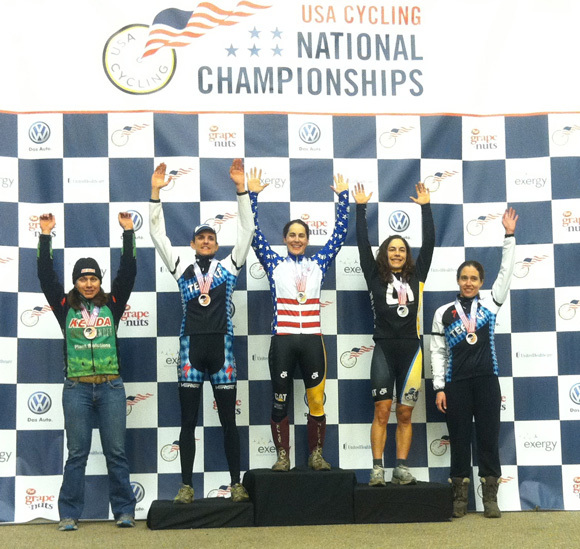 On January 6, 2012, Andrea Smith (Minuteman Road Club-LadiesFirst Racing) won the gold medal in the Masters Women 30-34 USA Cycling Cyclo-cross National Championship in Madison, WI. Kudos as well to fellow MRC-Ladies First team member Crystal Anthony, who battled her way through the field to win silver. Smith, currently ranked fifth in the U.S. International CX Elite Women’s standings and captured five 1st place finishes in the 2011 CX Season. Anthony also has five top podiums to her credit in 2011 and is ranked 14th in the U.S. International CX Elite Women’s standings. Congratulations to you both from your fellow MRC and Ladies First teammates for finishing your season on top!